To make the dressing, heat the remaining 3 tablespoons of oil in a medium saute pan over medium heat. Once hot, add in the onion and saute for about 5 minutes. Add in the garlic, salt and maple syrup and cook for an additional 2 minutes. Transfer the onion mixture to a blender, add in the balsamic vinegar, and blend until mostly smooth. Add the chopped kale to a large bowl, pour the dressing over top, and massage the dressing into the kale. Massage for a couple of minutes until all of the kale is coated with the dressing and a rich dark green color. Do not skip the massage! It makes the kale much softer and a lot tastier. 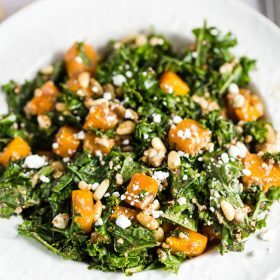 Gently toss in the butternut squash, pine nuts, and goat cheese. Serve immediately and ENJOY!